A dog that gets to chew Farm Food Rawhide bones from an early age will become a happy companion, with a fresh breath and a healthy mouth. (If an older dog has already developed tartar, this must first be removed before the same effect may be expected). Farm Food Rawhide is made exclusively from fresh, approved cattle hides. The production company is part of a large slaughterhouse. The hides are processed immediately, as opposed to many nameless chewing products. Farm Food Rawhide is fully digestible. While chewing, collagen is released which dissolves plaque. This can prevent the formation of tartar! Farm Food Rawhide is produced in an absolutely clean and safe manner. The hides have been washed with hydrogen peroxide (H2O2) several times to kill any bacteria present. This means the hides have been safely bleached in order to obtain a pure product which doesn’t smell and doesn’t get sticky while chewing. During the washing process the hydrogen peroxide is separated completely into one part water (H2O) and one part oxygen (O2). Farm Food Rawhide does not contain any undesirable substances. Before, during and after the Farm Food Rawhide production, no chemicals like chromium, arsenic or bromine are used. We also refrain from using dyes of any sort in order to get a more uniform (in terms of colour) and smoother looking product. Although (EU-approved) dyes are not considered harmful, we think it makes sense not to use such substances (because of the proven impact these substances can have on the behaviour of some children). 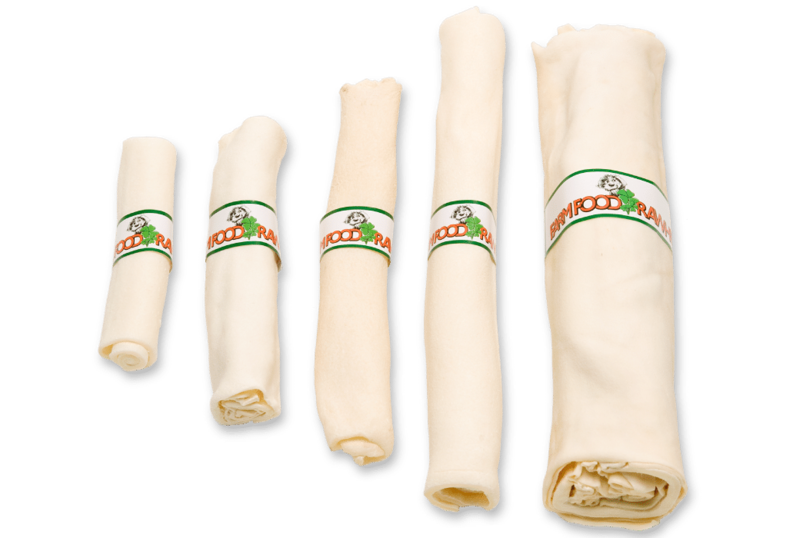 Farm Food Rawhide is manufactured according to HACCP guidelines. Farm Food Rawhide is non-allergenic! Combined, the abovementioned points ensure there should not be any allergic reactions while using Farm Food Rawhide. This is in contrast to many other, nameless chew toys. The fact that many “food allergies” are caused by impure, nameless chew products is increasingly well known. Farm Food Rawhide can, in most cases, be safely given to dogs that may suffer from food allergies (unless it’s an allergy which has been proven to concern beef). Farm Food Rawhide is a heavy quality product among its kind. The skins are not stretched and inflated in order to obtain a product that looks bigger to the human eye. Because of the thickness of the hides they last longer. Because of the thickness of the skins used, Farm Food Rawhide is much heavier than most other similarly sized rawhide products. Farm Food Rawhide is a handmade natural product. As a result, slight differences in shape among the individual bones may occur. Because each skin dries differently, some bones may have a lighter or darker colour than others. Using Farm Food Rawhide, you can keep your dog’s teeth clean and prevent the formation of tartar. This is why Farm Food Rawhide is tasteful, useful, healthy and fun for your dog. Farm Food Rawhide®, 100% real Rawhide®! No chemical antioxidants, colours and flavours. Directly produced and washed, making it a clean, pure and safe product. Pure thick cattle hide, for more chewing fun. Non-allergenic and no allergic reactions in your dog. A treat for dog’s teeth. A pure and heavy quality product. Farm Food Rawhide is available in the more reputable pet stores, veterinary clinics and grooming salons in various sizes. Make sure the size you buy at least matches the size and bite force of your dog. Make sure to always keep an eye on your dog while it’s chewing on the bone.